INON UK’s Steve Warren, co-designer of the INON UK Level One Underwater Photography Course, will be teaching the program exclusively at Diamond Diving on the Cote D’Azur in May. Steve will be running two courses, the first on 2nd and 3rd of May and the second on the 4th and 5th. Running the course over two days keeps it laid back and allows plenty of individual attention. The INON UK Level One Underwater Photography Course is designed to fast track divers with limited experience of photography on land or underwater to early success. The course provides the knowledge, practical skills and hands – on experience to remove the element of luck from underwater photography and help the diver consistently achieve pleasing pictures. The INON UK Level One Underwater Photography Course recognises that underwater photography is not a diving specialty, but a photographic one. Over six theory sessions, four photo dives and extensive debriefs of each students achievements, Steve will demystify taking pictures under the water. Students will learn wide – angle and close up techniques, how to use flash to achieve even and backscatter free images and a few creative lighting skills as well. The INON UK Level One Underwater Beginners to Intermediate Underwater Photography Course is the first to be endorsed by a leading manufacturer of underwater camera equipment. This is how Gavin Parsons desribed the course for “Diver Magazine.’ I’VE BEEN A PHOTOGRAPHER since I was 11 and a professional photographer both on land and under water since 1994. I have seen quite a few underwater photography courses for compact camera users, and while I would hate this review to end up sounding like an ad, I believe this is the most professional, intelligent and well thought-out I have come across so far”. Steve rarely runs Level One Courses himself these days, so this is a rare opportunity to learn from the co-designer. With extensive media credits gained since 1994, including filming underwater for BBC and ITV shows, an extensive back catalogue of magazine articles and project managing a number of dive books, Steve is well regarded in underwater photography circles. He is a contributing author to Martin Edge’s ‘The Underwater Photographer’, considered the best manual for underwater photographers and co – founded the “Visions in the Sea’ underwater photography conferences. Steve will be teaching underwater using his trademark radiophones to ensure each student gets plenty of personal coaching during the photo dives. Maximum class size is four. For more details, please contact Alex Diamond. After each IE we will be having some serious fun with a three day Specialty Instructor Training course, that will really set you aside as a new professional serious about their future career in the scuba diving industry. For more information click here. 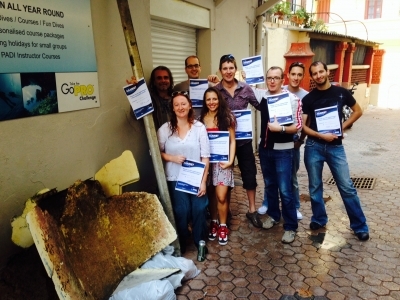 On Sunday October 19th we ran our second Project Aware Dive Against Debris of the season. Very successful and huge fun had by all as we collectively recovered another 30 kilos of rubbish messing up the environment of one of our favourite confined water training sites on the Cap d’Antibes. Thanks to Daniela, Tim, Paul, Eric, William, Fabrice, Oscar and Ruth for their fine efforts! Long overdue time for a little update. In April we had an excellent Instructor Development Course with two young candidates, one French and one English. Manu did very well at the Instructor Examination in Marseille and is now working in his second season for a dive centre in Sicily. 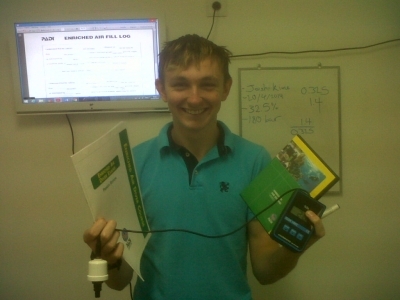 Josh also did exceptionally well and has returned to his studies in Marine Biology at Newcastle Univeristy. He’ll be becoming a PADI Instructor hopefully with as strong a performance as Manu next Spring. The next IDC starts a week tomorrow, on May 24th with the two free days of preparation we offer to candidates to get them as up to speed as possible with skill demonstrations and their theory. Aside from that a big well done to all those who have completed courses with us since April…Deep Diver, Dry Suit Diver, Advanced, Open Water, Scuba Diver…congrats and thanks to Helena, Malin, Tom, Giorgos, Tristan, Jenny, Soledad and Ludovic. Congratulations to Tristan Croizard on the best marine life sighting of the early season period…a very large tuna zooming overhead on the drop off of Le Grand Boule on his Advanced Open Water qualifying dive. And finally The Master Scuba Diver Wall of Fame is now in place in the dive centre….who will be next to gain a prestigious place here??!! We look forwards to seeing you all soon. Reasons to dive with us in 2014…. We had a great write up in the February issue of Sport Diver magazine in the UK. For those of you considering doing a course or some fun diving with us, this really gives a good and faithful insight into the diving with us on the Cote d’Azur. The article was the second in a series of articles called “Wining & Diving” was put together by Nick and Caroline Robertson-Brown, and the latest installment, just out, talks about California with a great cover photo by Nick of Caroline in one of the famous kelp forests. To see more of the great work that Nick and Caroline do please click here to visit their excellent website. We have a number of vacancies available for our highly sought after DiveMaster Internships this season. Ideally you will already be a qualified Rescue Diver with RYA Powerboat Level 2 or equivalent. Effectively you become a working member of the team for two months, getting trained thoroughly up to DiveMaster level and getting a solid start and experience in the dive industry. Part of a small team, you will benefit from being in contact with experienced Instructors, including a Course Director on a daily basis. To be considered please send us a CV together a covering letter outlining your motivations and why we should consider you above other candidates. The periods for the Internships are mid April to mid June, mid June to mid August and mid August to mid October. Once again for 2014 we are running a full Instructor Development programme with six IDC’s scheduled. It is also possible to reserve stand alone Assistant Instructor, OWSI, Staff Instructor, Emergency First Response Instructor and Specialty Instructor courses. The dates for our Specialty Instructor courses and 11th to 13th March, 29th April to 1st May, 10th to 12th June, 7th to 9th October and 16th to 18th December. On Sunday we enjoyed a successful end to an emotional and intense two week journey and three new PADI Instuctors entered the world! We’d like to share the success of Christophe, Benoit and Fabrice with you, as they worked extremely hard with a smile and a great attitude throughout the course. With one of them off to Sri Lanka, and the other Mexico, we have an idea of the international opportunities that becoming a PADI Instructor open up to you. Each programme also has a three day Specialty Instructor Training Course (commonly known as MSDT package) following on after one or two rest days. We pride ourselves on the added value we offer candidates during this programme. 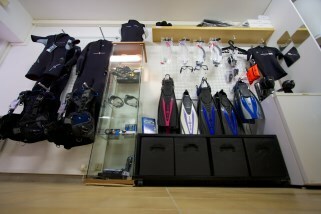 More details coming soon, but for further information call +33(0)615305223 or e-mail info@www.diamonddiving.net. What a season, first year as a 5*IDC Resort…. So, mid October, and despite the continuing outstanding diving conditions, the season is almost done. This has been a great year for Diamond Diving and we’d like to pass on a big thank you to all of our clients for their loyalty and passion for diving that contribute to enabling the business to grow and develop. And of course a massive credit to Romain and a number of dedicated interns (Joanne, Katie, Nicolas, Jonathan & Neil) for helping make 2013 such a success. 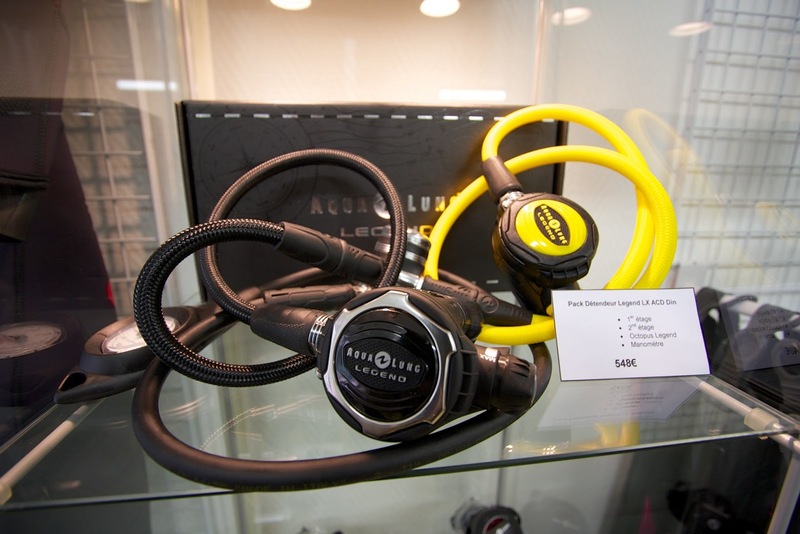 The ProShop has been a good introduction and we urge all of you to consider the series of offers we have put together for Christmas, some great deals on excellent quality dive gear from one of the world’s most prestigious equipment manufacturers : Aqualung. Everything must go! We’re not done yet…another PADI Instructor course for late October and early November, and a fabulous weekend to La Londe Les Maures to dive the awesome Parc National de Port Cros. Plus as some of you are aware we are in the early stages of putting together a liveaboard trip to the Maldives in Winter 2015. This one is going to be very very special, so if you’d like more details please let us know. Alex, Nono & the team. News for May….lots going on! Lots going on at Diamond Diving at the moment. On the 7th May we have a full Open Water Course starting for which there remains one place. On the 12th May we have a Project Aware underwater cleanup at one of our most frequently used confined water training sites off the Cap d’Antibes. This is nearly full but there is a standby list in case anyone drops out so please let us know if you are interested. We highly recommend all divers to create their own My Ocean account on the Project Aware website at www.projectaware.org. Here you can also download for free the excellent book Our World, Our Water which has a wealth of information on the world’s seas and oceans. There is an Open Water Referral (for those who have already completed theory and confined water training elsewhere) running on the 15th and 16th of May and we have two spaces left. Two places are still up for grabs for the Discover REBREATHERS day we are running in conjunction with Jean-Francois Andre of HippoConsulting. For €80 you get one of the best known techincal diving instructors in France supervising and guiding an introductory experience at a 2:1 ratio with roughly 25 minutes in the water. Let us know if you would like to participate. We also have a full 10 day intensive DiveMaster course running from 25th May to 4th June. We are also really pleased to annouce that are Aqualung ProShop is now open for business so we can help you with all of your equipment purchase needs. The water is warming up nicely and the great weather is on it’s way so we look forwards to seeing you in the South of France soon. 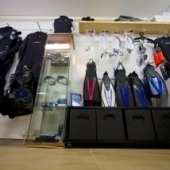 Project Aware, Next IDC, Aqualung ProShop, Discover Rebreathers Day and much much more…. So, loads of news to share with you all. 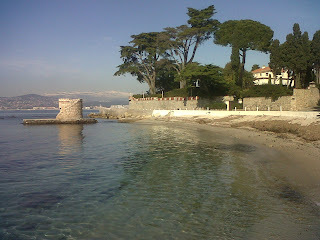 The water is warming up nicely on the Cote d’Azur and is a balmy 15 degrees at the moment. The last few dives have revealed loads of life including Nudibranches, huge schools of Sardines interpersed with the Damselfish, Octopi, Morays, Scorpionfish, Blennies, Sar…really encouraging for quality of diving for the forthcoming season. 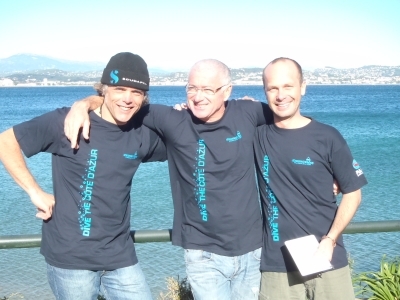 We have a Project Aware Underwater Clean Up coming on Sunday 12th May and the following Sunday (19th) we have a “Discover Rebreathers” Day with Jean-Francois Andre of HippoConsulting, one of the leading Techincal Diving Instructors in France. There are a couple of places left, so please let us know if you’d like to participate. Our new Aqualung ProShop is now in place so we’re obviously more than happy to advise on the best equipment choices for our clients, if we don’t have something in stock it can be ordered in and delivered normally with the matter of a few working days. The next PADI Instuctor Development Course starts on May 27th and we have one place left. This will be a bi-lingual IDC with the lead language as English but any necessary and complementary explanations in French are available, of course. The IDC will be almost immediately followed by a three day Specialty Instructor Training Course starting on the Tuesday after the Instructor Examination. For more information about our Professional level PADI training courses please e-mail Alex on alex@www.diamonddiving.net. Come diving with us in 2013…. Here is a little taster of the Diamond Diving effect, and how we tend to make our clients happy. Everthing from Discover Scuba Diving to a full programme of PADI Instructor Development courses…we look forwards to welcoming you on board soon. 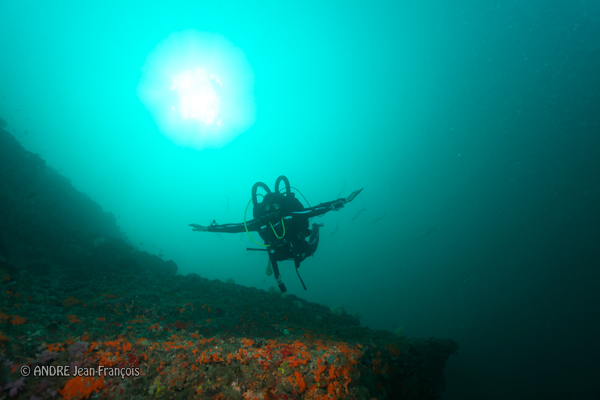 Come diving with us in 2013! Venez plongee avec nous en 2013!